Hanover's "Wood Guy" Built A Business Doing What He Loves. Hanover's "Wood Guy" Lowell Thomas Built A Business Doing What He Loves. Lowell Thomas looks like the kind of guy who could build you a house with his bare hands, tear it apart, and then put it together for you again. Turns out, he is. At a little under 6 feet tall, Thomas, 37, has a physique as sturdy as the century-old, hand-hewn wooden walls of his office, and exudes a soft-spoken confidence. Seated behind a polished walnut pedestal table, an ax in his hands, Thomas shows no shortage of physical competence, either. It's a combination that's allowed him over the past decade to build a successful Hanover business all the while learning about and working every day with what he loves. Brazilian cherry, black walnut, antique hickory, he says, as if naming old friends. "The richness in some of the colors of the antique woods," he says, running his hands across a smooth table, "only time can do that. It can't be reproduced." You see, Lowell Thomas is a "wood guy," self-proclaimed and with an unabashed love that runs from dimples down to dust-stained shoes. The son of a skilled craftsman and the grandson of a man who years ago laid the foundation of his small-town church, Thomas is actually the fourth generation in a line of builders that for years has focused on making wood work and shine. He hopes his son, Gage, will be the fifth. Thomas' journey to where he is today -- in charge of a burgeoning Hanover-based business that does everything from barn restoration to custom kitchens -- was a winding road, but walking around his 27-acre property in Hanover's industrial district, Thomas says that road has allowed him the freedom to chase down a rainbow of wonderful woods in red, yellow and brown. It's allowed him to rediscover and preserve a part of our collective history that could just as easily have been lost to time. It's allowed him, he says, to carve out and build his American dream. It started about 10 years ago with a $1,200 tax-refund check. 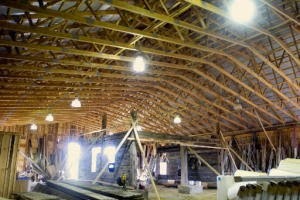 It started with a dilapidated Adams County barn that ended up taking Thomas more than three months to tear down by hand. It started, really, when a criminal-justice major and youth-development officer at York Detention Center embraced what, for him, is an interest that's turned into a passion. "My wife thought I was crazy," he says. But it's a passion that's since made Lowell Thomas your go-to guy for all things wood. 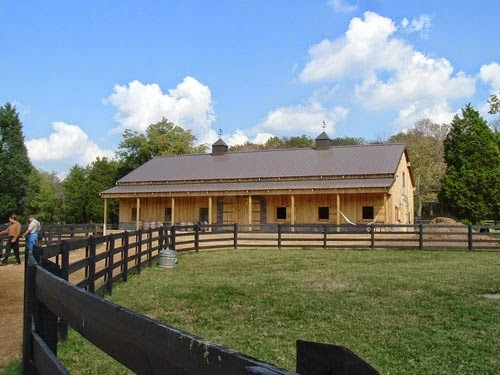 That first barn, which Thomas took apart with his hands, soon led to National Barn Company, which provides a line of pole buildings and barns, custom-designed and delivered. And more recently it led to Patriax Log Structures, Thomas' company that for the last three years has offered log cabins built the way they were in America's early years, and often with wood from that same early era, reclaimed and reused by Thomas and his staff. In that way, Thomas' love of all types of timber has led to a business that, by gathering and reshaping old wood, actually helps the environment, cutting down on fossil-fuel emissions that accompany the production of things like linoleum or insulation. And because the wood from older trees -- which were allowed to grow more slowly and develop -- is actually denser than newer growth, it's not only beautiful but also energy-efficient, he says. "There's none of those pink insulation strips here," Thomas says. "Wood the thickness we use rates twice as high for insulating." And working from a single, simple principle -- "wood is good" -- Thomas has expanded from his early days, picking up new tools and techniques along the way, and eventually working on restoration and reclamation projects across the country and all the way to the bottom of St. Lawrence Seaway. There, at the bottom of that cold water, lies thousands of pounds of virgin timber, Thomas explains, all of it lost from the capsized pine rafts of early American settlers, who were in charge of harvesting the ancient wood and getting it on ships back to England. Feet-thick trees were hashed with the "king's broad arrow" -- a mark to denote its destination -- and loaded on the rafts. But because of the weight and density, often those rafts would split, sending both trees and traffickers to the bottom of the cold waters. There that wood remains, Thomas says, perfectly preserved, waiting to be brought back to light of day and maybe used as part of someone's house. It's one extreme example of what Thomas terms the "complete recycling" process his business helps create. It's how old wood can be reused to create a higher-quality, greener solution. "We salvage, not demolish," he says. "We reclaim what was lost." Lowell Thomas remembers when a 2x4 was just that: a 2-inch by 4-inch piece of wood sold at the store. Today, he says, at most lumber yards and home-improvement stores, what you get when you buy a 2x4 is more likely to measure about 1 3/4 inches by 3 3/4. It's what people have gotten used to when they buy wood, and it's what packs easier on trucks that haul that wood in bulk to stores across the country. It's cheaper to make, Thomas says. But just like all wood is not created equal, wood products differ, too, in quality. What you pay a little less for at a chain store may be far beneath the quality -- and durability -- of the wood you can get through one of Thomas' businesses, he says. And with a log-gathering, processing and sales network that casts a wide net, the wood at that chain store might not only be lower quality, he says, it might not even be cheaper. In addition to nearly a dozen crews working to reclaim and harvest wood, Thomas' Hanover business now features several fully built log cabins, which he can reproduce or modify for customers according to what they want, and likely the largest operating sawmill in a 40-mile radius. That milling operation was recently bought and brought to Hanover from a mill in Manchester, Md., another of Thomas' reclamations. In the process he also claimed Willie Montgomery, a second-generation saw operator whose father for years ran the same saw his son today uses to slice towering timbers into boards that are stacked like so many sticks of butter. Each day, the 52-inch circular saw blade and a bark-stripper of the milling operation snarl and grind away at trees right next to Thomas' office -- which remains ghostly quiet throughout. That's again thanks to dense, wooden walls, Thomas says with a smile. And that hulking machine next door also allows his business to take from one tree up to six different products, all saleable and all in demand. From real bark mulch for flower beds, to lumber, to an ever-growing pile of sawdust used for horse bedding, nothing goes to waste, Thomas says. "It all gets used here," Thomas says, standing on a thick wooden floor he laid in his sawmill. "What other people call scrap, we call a pedestal table." Living in south-central Pennsylvania, we have a wealth of wood at our fingertips, Thomas says, placing that ax back on his thick, hand-hewn office wall. The wood from old dairy barns in the area is unique -- older and unlike any other in the country, and usually there for the taking. And 60 percent of Pennsylvania is still forest. 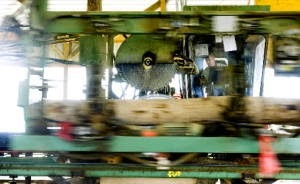 That leaves plenty of room for growth, Thomas says, both at the business' bottom line and more importantly at the tree line, where wood can be gathered and used to create something special for customers, then replanted, renewed, sustained. For the next generation, he says, 12-year-old Gage looking on with a notebook and pen at the ready. Gage is spending this summer learning the ropes, his father says, the two walking across a dirt floor in the middle of an 80-foot-by-102-foot building on Thomas' property. Within that larger building, though, a smaller one was taking shape even as father and son looked on. Thomas uses that shed for "pre-building," a process that allows the company to fully construct, label and then deconstruct completely unique buildings on-site in Hanover. They're then transported to the buyer and reassembled, with about 50-percent less time spent on-site. "We can completely customize the building," Thomas says, standing next to what will soon be a 30-foot by 46-foot log house and a two-car wooden garage in Gettysburg. "If a customer comes in and says they don't like one board, we can change it." 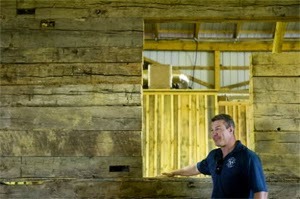 But what won't be changing, Thomas says, is a tradition of hard, hands-on work passed down to him by his father, who works for the company and who, on this day, is nearby using a hand-held metal detector to find nails in a 300-pound piece of old barn board. As he does, he deftly removes them with a hammer and chisel. Lowell Thomas Sr. says little, taking a break only to lift a pant leg and display the scar he got years ago when his overanxious son flipped one of those large boards over onto the back of his leg. Gage doesn't say much either, preferring to let his father -- and the family's work -- do the talking, as men with 2-pound hammers drive in another board, finishing a wall of what will be someone's home. "We tend to believe the good Lord put wood here for a reason," Thomas says. "And we want to use it. We want to keep using it. It's America's ultimate antique." And with that, Gage at his elbow, he goes back to work -- next to a sawmill, in a log-cabin office, behind a desk made from old barn flooring. Thomas sits quietly down next to an ax that glimmers like his green eyes when he speaks with quiet reverence of cherry and chestnut, cedar, oak and ash. A wood guy, he says, at your service.